Howlin' Wolf Records: SIX STRINGS: THE BIG GUNDOWN is finally here!!! There are THE STAR TREK nerds. There are THE STAR WARS nerds. I am a Spaghetti Western nerd. I have a bunch of them. I have books written about them including an encyclopedia which I have read cover to cover to learn about as many as I can. What I learned from my extensive research is that there are not too many good ones. Let me tell ya something, folks. 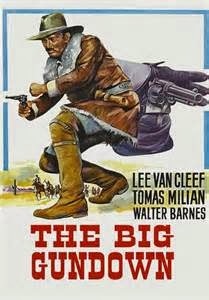 THE BIG GUNDOWN is one of the good ones. It is a must buy!